It was much too dark to get an HDR shot. I needed to use ten second (or more) exposures and the the blacksmith was moving too much. I set the camera setting to only take one pic. 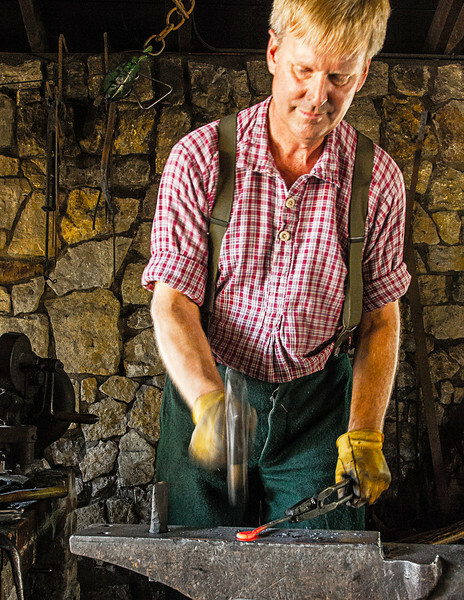 I chose a slow enough shutter speed to get the movement of him striking the hot metal with his hammer but still fast enough to keep the upper part of his body sharp, with no blur. Thankfully, I was on a tripod so I was able to keep the hot metal very sharp.